Now that Farmhouse is a household word people often ask if we think the farmhouse style will last. I quickly reply an emphatic YES, farmhouse style is here to stay. I personally love this style because it can be interpreted in so many ways and still look original and fresh. We sell a lot of paint, and Annie Sloan Chalk Paint is a go-to paint for painting furniture, easy peasy, anyone can do it. Here’s a quick video from Annie herself painting and distressing a chair. When you have old dated furniture with solid wood and good bones, paint is your inexpensive decorating friend! Painted furniture is a staple for the vintage farmhouse style and French farmhouse as well. Our shop also sells Miss Mustard Seed Milk Paint. Milk paint is one of the oldest paints known to man. You can get the chippy paint look, a signature style for farmhouse, easily with milk paint. There was a time when we could find farmhouse metal in good shape and it was actually vintage. Most of those pieces have been grabbed by collectors and decorators in the early days of vintage popularity. 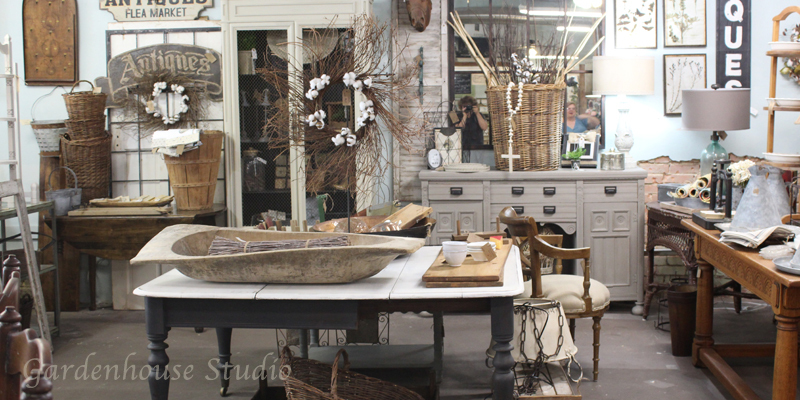 We never hesitate to buy when we see authentic vintage metal or porcelain at estate sales or flea markets! Farmhouse style embodies practicality and using things for more than one purpose is always key. 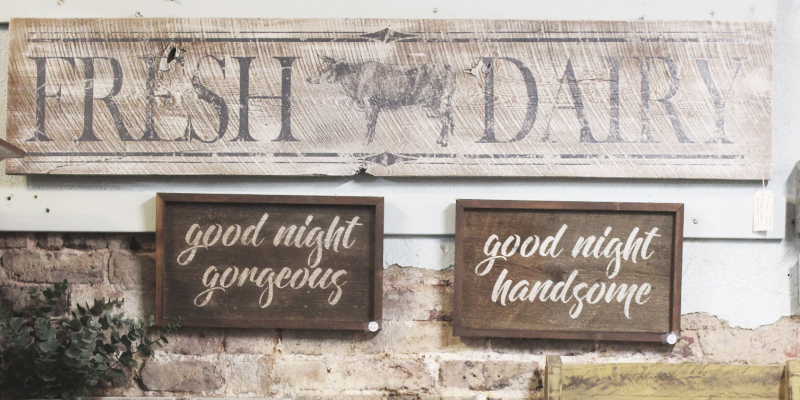 Recycled barn boards as signs are great for decorating this style. 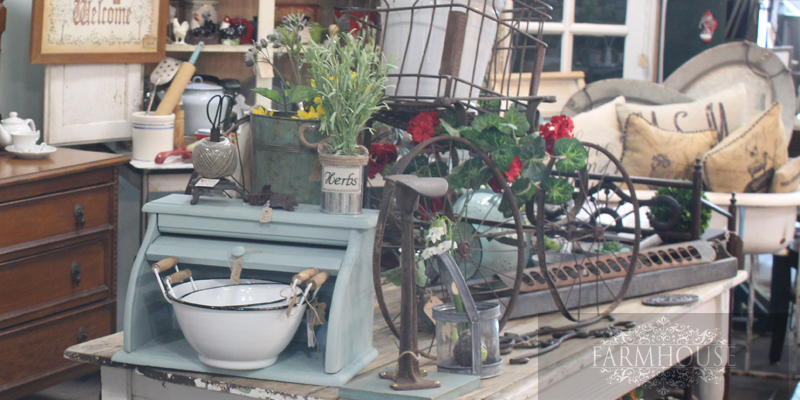 Find baskets and wooden crates to use for storage and increase your country farmhouse look. 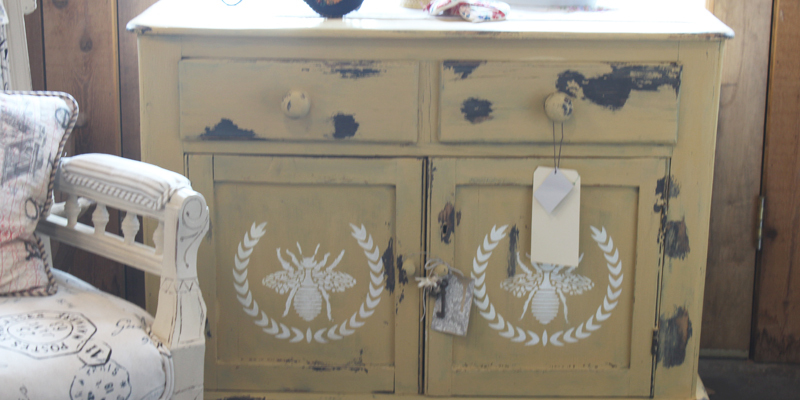 Painted wood furniture is a great way to update old furniture. 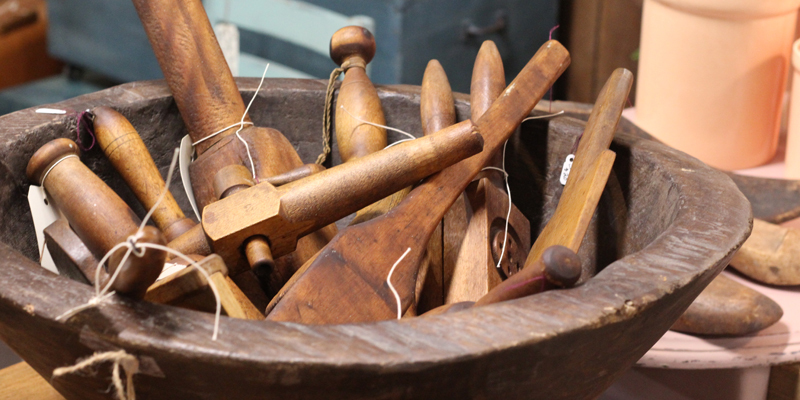 To a lover of wood, nothing beats the patina of old wooden tools that have been used over and over and then passed down to the next generation. Carefully oiled with our hemp oil and ready for another generation of kitchen work. Farmhouse style is green! Plants, garden items and outdoor decorations lighten Farmhouse style and keep it fun! Every decorating style needs a bit of whimsey and farmhouse is no different. 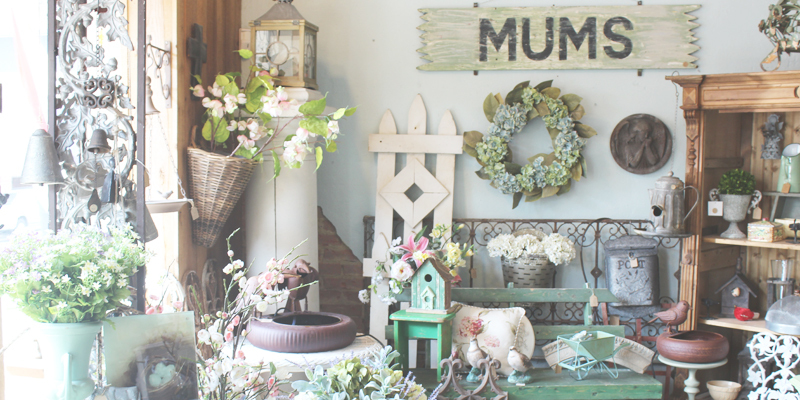 We love our little “farmhouse style garden room” at the shop!